This book gives everything it promised to. 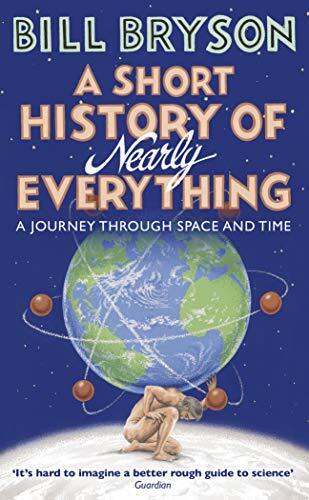 It gives insight into more scientific topics than you could shake a stick at - from meteorology to taxonomy, from vulcanic activity to the forming of solar systems and from E = mc2 to the structure of atoms. And I haven't even finished it. Besides, it is highly amusing. I would expect no less from mr. Bryson. I am in debt for all this work he did for us. I bought this book at Schiphol airport at the beginning of my honeymoon, thus being able to feed my new husband these interesting scraps of information, such as: "For millions of years, a gigantic, flightless, carnivorous bird called Titanis was possibly the most ferocious creature in North America." Or that the whole of Yellowstone National Park is in fact one gigantic caldera, or shield-shaped vulcan. In buying this book, I broke a long tradition of having Bryson books given to me by foreigners. But hey, who cares, so long as I am able to grasp a bit more of the world I live in. After I finish it, This short history will travel as a ring. It will be handed over to Elefeteria personally, at our meetup this Sunday in Nijmegen. Tomorrow Bryson goes to Elefteria. Biba gave me this ring yesterday at the meeting! I also got some tea for my birthday, so it's tea and reading this week! fortunally I have holiday :-) thanks Biba. it's time that it's going to travel again! Ah..the order has changed ;) now its my turn! Nice! This book wil be handed over to Rubyblue, Wandering or dutch-flybaby at Castricum. At last, I have this book. Wandering may have to wait a while for it. Not only is it a very thick book (over 600 pages), I am leaving in a week for 4 weeks in the States . . . I'm going to try to get read a number of other (shorter) books that I picked up at Castricum so I can release themin the US. So I won't even be able to start this book for at least a month. Thanks, biba! I received it back from Rubyblue today, in Borra, but now I see that wandering is still on the ring list. Well, she will get it eventually, at a next meeting perhaps.